Ward Apparel is the one-stop solution for all your uniforming and apparel needs! Let our embroidery expertise outfit you group with everything from golf bags to lab coats. Since we do our own embroidery we can certify the quality. Design your own uniform store that we bring to your doorstep. We’ll help you put your logo on apparel and select the uniform designs you want to offer to your employees. We offer the best in uniforms for Law Enforcement, Fire, and EMS professionals, including 5.11 Tactical apparel and accessories. 5.11 Tactical provides unmatched reliability and performance when it matters most. Browse our huge variety of scrubs, footwear and other professional workwear, on-site fittings, view logo samples and work with us to create your ideal uniforms. Your own ecommerce storefront, branded with your company’s logo, colors, style and content. Select what apparel can be bought, in whatever sizes and colors you want. 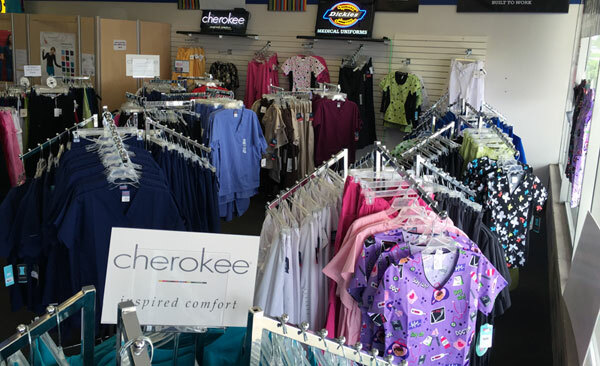 We have a huge variety of scrubs brands in either prints or solids including Bella, Burnouts, Grey’s Anatomy by Barco, Koi, Landau, AnyWear, Cherokee, Peaches and more. Also medical warm-up jackets, lab coats and medical accessories. The highest quality and widest selection of corporate apparel including custom embroidered polos, oxfords & more! All the best brands including Landau, Sanmar, Red Kap, Cherokee Uniforms and more. Whether you’re 1 location or 220, WARD Apparel has a program to outfit your students including scrubs, medical supplies, police/EMT, Culinary, Work wear and custom kitting. Embroidered or Screen Printed, Brand name or custom manufactured, we do it all. Custom reporting and billing, package per student and private web-ordering sites are just a sample of our services designed for educational facilities. Our staff has serviced the top school groups in North America and are ready to make your job easier. Need more info or have questions? We’re here to help. Quickly and easily add your schools logo, mascot or other design to our wide selection of clothing. T-shirts, sweatshirts, hats, pants, gym bags, you name it – we’ve got it! We have over 25 years of combined experience in school related fund raising and service as Booster Officers. We can help your organization raise money! Many brands including K-Swiss, Skechers athletic shoes, Dansko & Sanita clogs and more, with new styles and brands arriving daily. Flame Resistant apparel that is fully HRC2 and NFPA2112 compliant! Check out our wide array of Bulwark FR products.